What Is a Variable in Science? In today’s world, it is extremely common for people with access to the internet to look up any unusual symptoms they may be experiencing. Aside from potentially increasing your anxiety with all of this new information, being able to access relevant scientific information allows us to become more informed patients. In fact, health literacy, which describes an individual’s ability to obtain, process and understanding basic health information 1, has been recognized as an essential part of successful patient outcomes. Aside from Google searches that lead you to websites like WebMD, News-Medical.net and other useful websites like this one, it is also important for the informed patient to be able to read and understand the information provided in scientific articles. While this may seem like a simple task to achieve, reading a scientific article can be extremely complex and difficult to understand. This guide will help you better understand the research process that leads scientists to their results, as well as the best way to approach reading and understanding the information discussed in scientific articles. 2 What is the Scientific Method? 3 How do Scientists Conduct Research? Every scientific article is based on a series of steps that can be related to a process otherwise referred to as the Scientific Method. The scientific method begins with a question, which is followed by several subsequent steps that allow researchers to recognize the background information and tools they will need to ultimately find the correct answer to that question. See Figure 1 below for more information on how the Scientific Method is conducted in any research setting. Figure 1: The steps of the Scientific Method. Every step of the scientific method is performed as a collaborative effort that must be well-documented by every researcher involved in the study. By recording all observations and maintaining accurate documentation of all experiments, regardless of how the results come out, researchers are able to share their scientific findings to people around the world who are interested in the same topic. How do Scientists Conduct Research? All scientific experiments can be better understood as cause and effect relationships between all involved parts. In this relationship, variables can be thought of as the cause, and the effect of your changing variable ultimately plays a role in answering the initial question that brought you to this study in the first place. Variables are an important aspect of almost every scientific experiment. A variable describes any aspect of the experiment that can be controlled, changed or measured. Therefore, choosing appropriate variables in any experiment plays a crucial in determining the outcome and reliability of your experiment. In any scientific experiment, researchers will typically make some type of change to the independent variable, whereas all other factors of the experiment will be constant. For example, if the ability of a new herbal treatment to treat diarrhea is being tested, the independent variable would be the amount of the herb that is given to the patients, whereas the controlled variable would be the herb’s ability to stop diarrhea from occurring. The different types of variables that can be included in any scientific study are further discussed in Figure 2. Figure 2: Variables involved in scientific experiments 2. 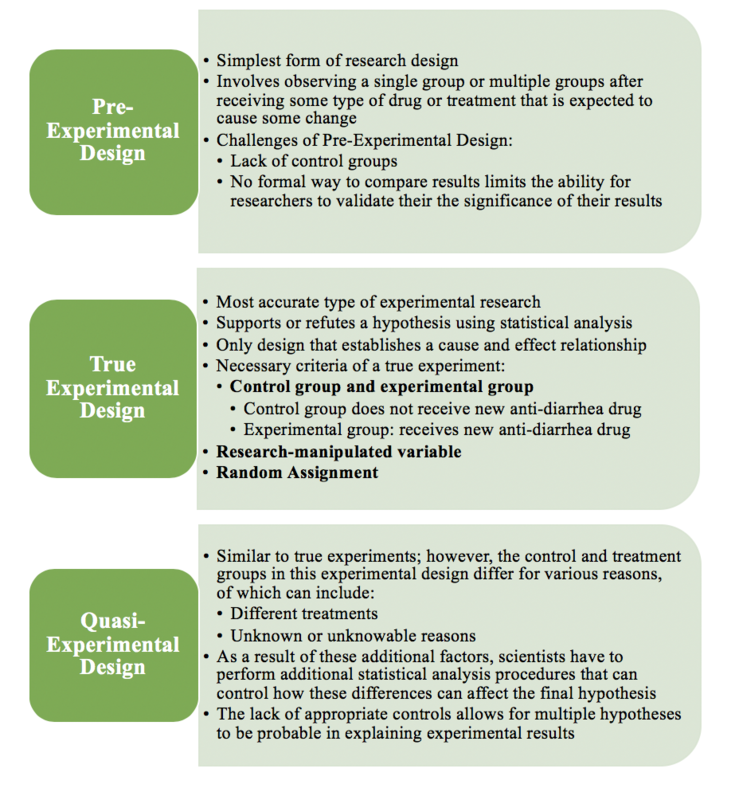 There are three major types of experimental research designs, and within these designs include various types and elements that play a role in determining the success of each experiment. Figure 3. Different types of scientific study design 3,4,5. Before any type of drug, treatment or vaccination can be administered to human beings, an extensive series of experiments involved in the pre-clinical testing stages must first be performed. While animal testing is a controversial subject, it is necessary for any drug or vaccine to be tested in animals to determine whether there is any actual benefit of the drug and any potential side effects that can be expected if this drug continues to human clinical trials. How potent is the drug? How effective is this drug in treating symptoms? Does this drug cause any toxicity that outweighs its therapeutic benefits? How much of the drug is absorbed by the body after taken? Are there any unwanted interactions that occur between the drug and the various molecules that exist in our bodies? How much of the drug is eliminated (either through urination or defecation)? Is this rate of elimination too fast or too slow? What organs can be affected negatively by this drug? Does this drug cause any unwanted effects? In vitro, which translates to “in glass” as a way to refer to the Petri glasses that have been traditionally used to contain cell cultures, are extremely important scientific studies. As a relatively fast, simple and cost-effective investigation method, in vitro models provide useful information on the way in which drugs behave when exposed to a specific type of cell type or tissue. What this type of experimental model provides is important for establishing preliminary data, it is limited in its ability to determine how drugs will interact with other cells of the body. As a result, when a drug appears to exhibit beneficial effects in vitro, scientific researchers will typically continue to expand their work to relevant in vivo models. In vivo, which translates into “in living [organisms],” is one of the most controversial aspects of scientific research, but is also one of the most important aspects that allow new and potentially curing drugs to arise. Prior to beginning their studies on animals, researchers must carefully choose species-specific physiology and other similarities in regard to the target organ of their treatment to ensure that their experiments are scientifically valid 6. Animal research is highly regulated by the government, as well as within the institution where the research is being performed. It is very common for in vivo experiments to be performed in rodent species such as mice, rats, guinea pigs and hamsters; however, other animals can also be used if the treatment warrants its use. The design of a clinical study plays a huge role in determining the overall reliability and transparency of the research. For example, studies that do not utilize a control group are considered less reliable as to those that do include control groups. Additionally, the number of test subjects, which is otherwise known as the sample size, also plays a crucial role in determining how reliable the results of a study are. For example, it is common for animal research studies to involve 8-12 animals in each treatment group, whereas clinical trials can involve as much as 3,000 patients. The success of a treatment based on a sample size of 3,000 is much more reliable than that which is conducted on a sample size of 8. As shown in the figure below, the type of study design increases in its rigor and accuracy while reducing its susceptibility to error as you move up in the pyramid. In addition, the level of complexity of these study designs also increases as you move up the pyramid. Figure 4: Levels of clinical research study designs in decreasing levels of rigor. Meta-Analysis: Combines data from various individual research studies. Systematic Review: Critically reviews and evaluates all research studies that have been conducted on a specific clinical issue. Randomized Controlled Trial: Randomly assigns participants by two or more groups within a clinical trial. Cohort Studies: People who currently have a specific condition are followed over time and compared to people living without that condition. Cross-Sectional Studies: A specific population at a single moment in time or time interval are observed and evaluated. Case Reports and Series: Evaluates a group of patients that have experienced a specific outcome of interest. If the data in a scientific study does not turn out to be statistically significant, does that automatically determine that these studies were negative? In these situations, scientists are left to determine whether their study, in fact, proved to show no effect or any difference when their medication was used as compared to the standard. In these situations, it is important to remember: The Absence of Evidence is NOT Evidence of Absence 8. What this means is that while the drug or treatment being tested did not appear to be significant, it is important for researchers to establish a threshold that designates whether the effect of their treatment was, in reality, too small to be determined as important. While this is a fairly uncomfortable area in research, the science community is hopeful that, with support from journals that are willing to publish uncertain results, researchers will be more willing to discuss this complicated subject. Now that you have gotten through this article (yes, I know it was a lot), you should have a much better understanding on why scientific research is conducted, the different components that make up any basic experiment, as well as the different ways in which research can be conducted. As you continue to expand your knowledge on the constantly advancing science world, your ability to truly understand what is being discussed in any scientific article will prove to be invaluable.